One solution is to use the filter on a smaller image, but of course I want the high resolution in clear quality. 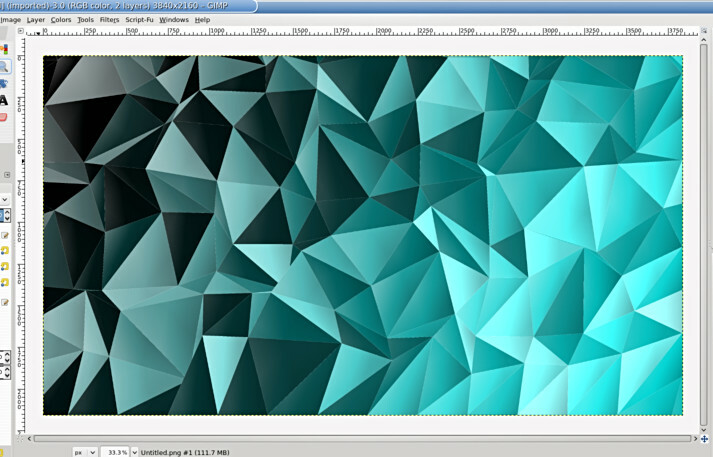 The first image is with maximum tile size on a 2k working file. If there is some way to un-cap the maximum tile size in that filter (I could learn how to edit the plugins, if that is not too hard! ), or another filter with a similar result, or something else, I'd love to know! It seems to me that the limit is arbitrary and that the plugin would work just fine with a limit of 500%, if not more. I had a bit of a scout around, probably the same places as yourself. Maybe in G'mic somewhere but I could not find much. 2) know what you are doing. It might (a very qualified might) be possible running the mosaic plugin but by-passing the settings dialog. This is using the batch plugin BIMP but with just a single source. As a comparison, same size canvas, I was unable to get the hard effect but that might be my gradient/settings. The plugin does leave transparency so I had to slip the original gradient underneath. 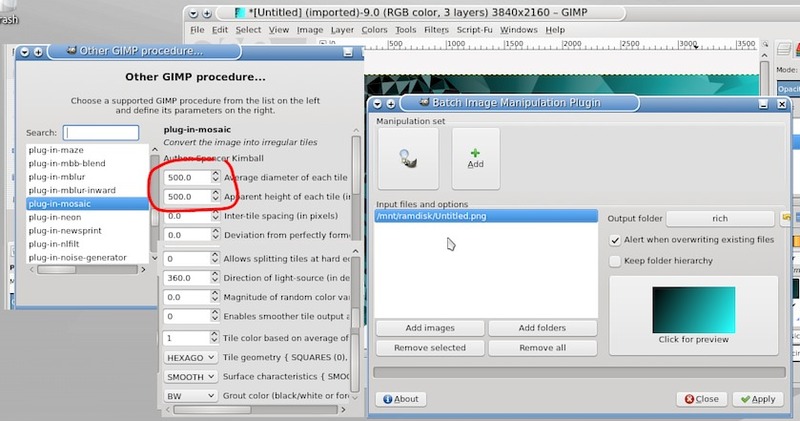 The BIMP settings are shown here, http://i.imgur.com/rjRUxmP.jpg If you find suitable values (no guarantee), then it should be possible to run Gimp from the command line. 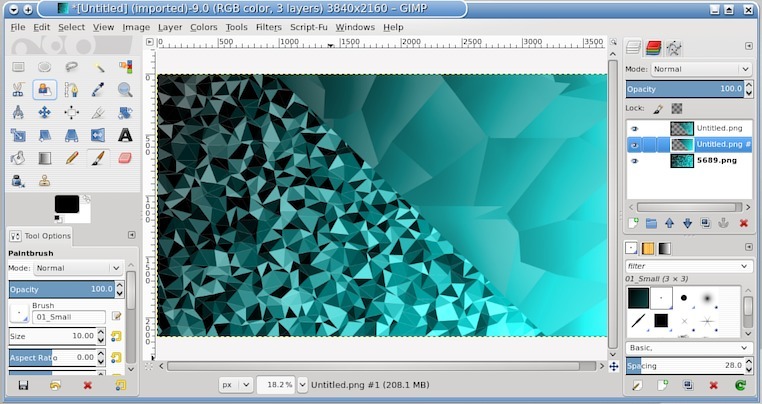 BIMP is slow to render a 3840x2160 image so larger images will be a drag. Maybe experiment with some small images first. Hopefully someone will come up with another solution. Ah, these are wonderful, the 'latest try' is exactly what I was looking for! Once I have the chance I will try this myself, and if all goes well (or not) I will post again. Update: I installed BIMP and got it working (Very well, I am sure I will use it for other things as well!) and I have been able to do exactly as I wanted. Thanks again for all the help!